SureStamp is a stamp concrete overlay that is a single component, just add water that can be colored easily with any of our 30 standard stamp overlay color additives. Unlike other stamp overlay products, Sure Stamp and be applied on existing cement as thin as 3/8″ to provide unlimited texture designs for pool decks, patios, sidewalks, and driveways. SureCrete’s SureStamp™, a stamp concrete overlay is a stampable concrete material, cement-based topping for beautifying both interior and exterior concrete surfaces like stamping patios, pool decks and much more. SureStamp ST™ contains additives for slower cure times for warmer weather making it have a longer work time. Used on existing plain concrete, it creates textures that resemble a whole array of designs: tile, cut stone, slate, boardwalk, brick, cobblestone, etc. with traditional concrete stamping tools. Costly tear-out and replacement of existing concrete can be eliminated. A SureStamp™ stamp cement overlay offers restoration, repair, resurfacing, architectural accenting, and surface protection of existing concrete. SureBond™ (see TDS) a cement-based bonding agent, must be used in combination with SureStamp™ stamp floor overlay to achieve the ultimate adhesion essential in a stampable overlay. It is seasonally user-friendly, available in Summer and Winter mixes. Surecrete’s stamp concrete overlay can create incredible three-dimensional textures makes it the perfect outlet for artistic inspiration. Designs using SureStamp™ stamp floor overlay has been used to create views of themed flooring and textures in many theme parks and resorts including Walt Disney World project, Universal Studios Orlando and Busch Gardens in Tampa, Florida. With the ability to apply a wide array of pre-made rubber stamping molds and textures including faux stone, brick and even custom stamp texture patterns like stamped concrete home patios and pool decks. Our products also allow contractors to be able to manipulate your surfaces for custom-carved concrete manually make SureStamp stamp cement overlay an incredibly versatile product for creating artistically themed concrete and stamped colors exhibits. 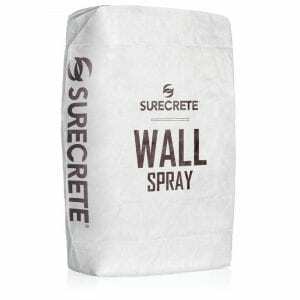 How Do You Apply SureCrete’s stamp overlay Texture Bag Mix? Add Approx. 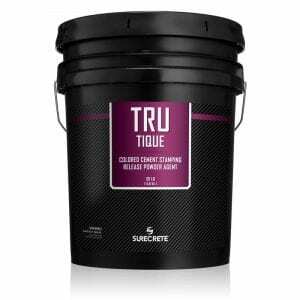 3.5 quarts water per 50 lb bag to 5 gal bucket and mix in any color desired for the integral coloring of SureStamp stamp cement overlay. Slowly introduce SureStamp while continuously mixing and mix for a minimum of 1 minute once all product has been emptied into a container. Scrape the sides of the bucket to make sure there are no “dry pockets” that didn’t get mixed properly. Mist the surface of the concrete with water ahead of any areas about to receive SureStamp stamp overlay. While the SureBond is still wet, pour the mixed SureStamp onto the surface. Gauge rake the product to the appropriate height for selected texture/carving pattern (usually between 1/4″ and 3/8″). Smooth the surface of product with a metal squeegee or similar tool. Allow product to begin to dry, yet remain plastic. The surface will lose its wet sheen and yield to the touch with tiny, if any, sticking to the finger. The surface is now ready to receive a stamp pattern or custom carving. Be sure to use a releasing agent on any tools used to manipulate the surface, and to clean releasing agents off of finished surface before next step. Once the surface has dried and cured sufficiently (approx 6-8 hours), it can accept stains and secondary colorants and is also ready to receive a sealer. Typical outdoor applications would utilize an acrylic sealer from our SureSeal line of products. 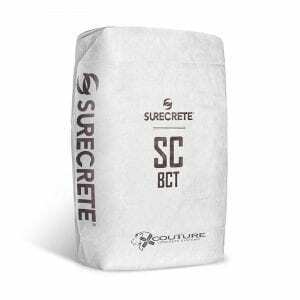 Contact your local Surecrete dealer for a preferred concrete contractor in your area for stamped costs and design ideas. Do I have to use SureBond along with SureStamp™ stamp overlay? Yes. Without SureBond™, the SureStamp™ product will not adhere to your substrate correctly. Do I have to use SureBond™ along with SureStamp™ stamp overlay? Yes. Without SureBond, the SureStamp product will not adhere to your substrate correctly. What do I do if SureStamp starts to get too sticky before I’m ready to manipulate it? So much time as it has not become hard, you can use a product like Surface Delay to allow for more work time on your surface. This will only slightly delay the process. However – timing is everything with SureStamp stamp concrete overlay. What if I want a custom stamp or carved design with SureStamp? Custom engraved patterns require only your imagination and a proper carving tool. If you want a pre-made texture stamp, contact your local distributor for more information on where to acquire stamping tools. 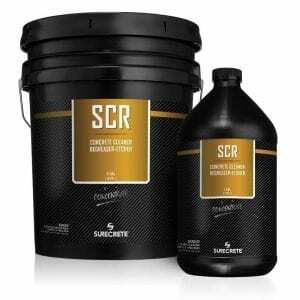 SureCrete Color Hardener is premixed, dry-shake, colored concrete hardener. It is used for coloring and hardening freshly placed concrete flatwork to produce an aesthetically pleasing pavement with a surface that is substantially harder and more wear-resistant than regular concrete. This coloring method can be utilized for concrete flatwork applications (salt finishes, broom finishes, rotary finishes, etc. ), as well as vertical surfaces and other types of architectural concrete. 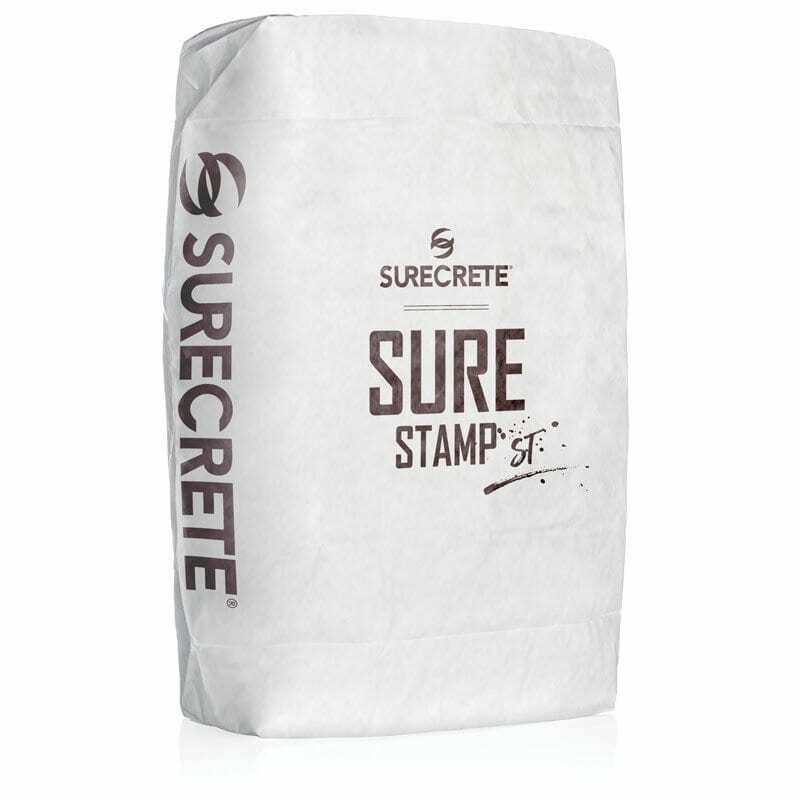 Powder Release SureCrete Powder Release contains a specially formulated releasing agent that forms a moisture barrier between the stamping tools and wet concrete to allow the release of stamping tools. In addition to releasing agents, powder release contains integrated iron oxide pigments that simultaneously provides a secondary accent color to the concrete surface. As a dry shake material, it is broadcast directly on top of the concrete to be stamped. It is recommended only for stamped concrete, as opposed to stamp overlay. SureCrete Design Products’ concrete colors are pure, synthetic, iron oxide pigments containing no fillers that will affect the performance of the concrete mix design. SureCrete Design Products’ concrete colors applications provide the user with a lightfast, weather resistant, lime-proof, no maintenance finished product. 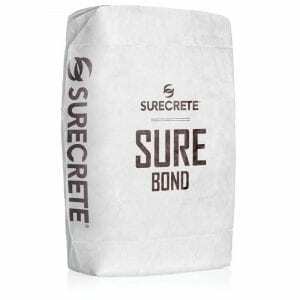 SureCrete Design Products maintain the highest tinting strength and color consistency from bag to bag. Each batch is custom formulated for each job. 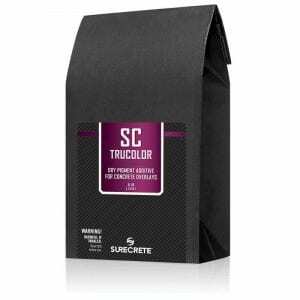 Color Packs SureCrete Design Products’ Color Packs are conveniently pre-measured to individually tint any single bag mix in the SureCrete Design Products’ line. All Color Packs are pure, synthetic, iron oxide pigments containing no fillers that will affect the performance of the bag mix being tinted. Color consistency is maintained from Color Pack to Color Pack. These packs are the simplest way to integrally color your stamp overlay packet mix to your intended color design. Eco-Stain is an exciting alternative to typical reactive acid stains. There are no acids or harmful chemicals integrated into its design. Since no chemical reaction takes place, there is no extended waiting time for color to reach full development. Cement substitutes will not affect color, unlike reactive acid stains that are dependent upon alkalinity to create a chemical reaction. Eco-Stain’s in blues & greens will not spot black in the presence of moisture and are UV stable. 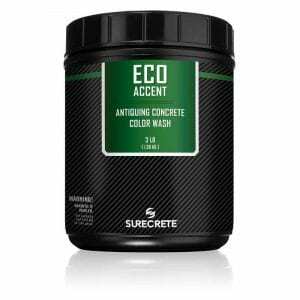 Eco-Accent is a water-based, non-hazardous, zero VOC, UV stable coloring agent that bonds to any textured concrete or cement-based surface including overlays. A single color, boring, lifeless, concrete can be transformed into a multi-colored, antiqued, variegated, surface. Restoration of old, dull, weathered stamped concrete or textured overlays may also be accomplished through application of Eco-Accent. 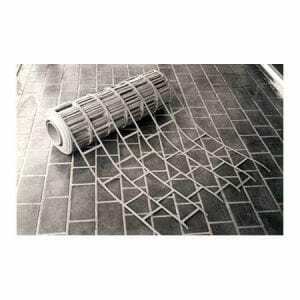 It is a great product for stamp overlay for floors. Do I have to use SureBond along with SureStamp stamp overlay? So long as it has not become hard, you can use a product like Surface Delay to allow for more work time on your surface. This will only slightly delay the process. 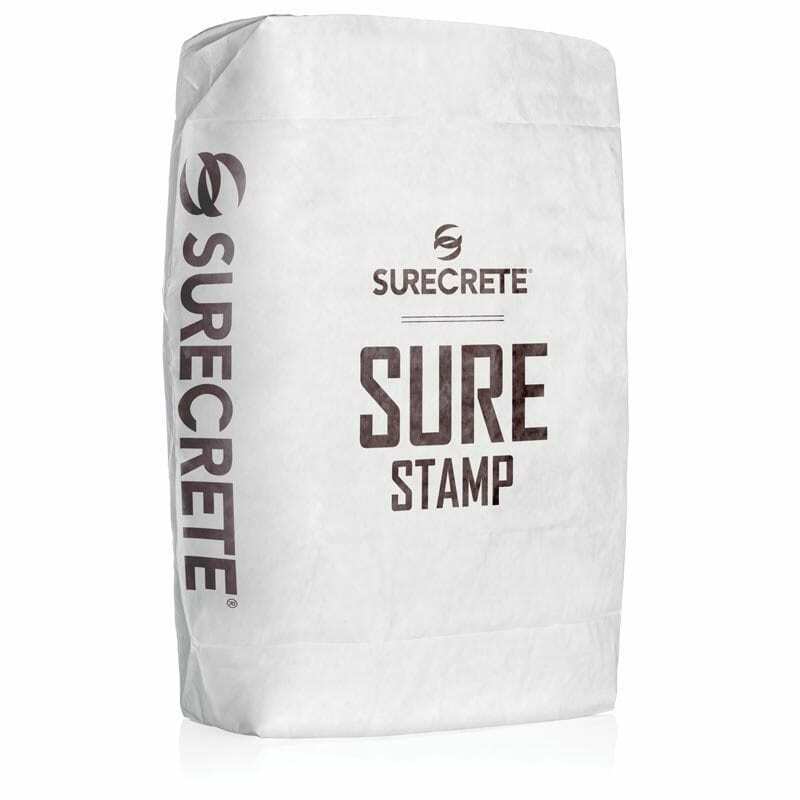 However – timing is everything with SureStamp stamp concrete overlay. Custom carved patterns require only your imagination and a proper carving tool. If you want a pre-made texture stamp, contact your local distributor for more information on where to acquire stamping tools.